I love sprouts and have often bought a pot of mixed sprouts from health food stores, but I’ve never attempted my own. Why I’m not entirely sure, but it’s probably because I consider sprouting like having a mini garden inside and I’m always the first to kill a pot plant. Despite my trepidation I gave it a go, and I have to say, sprouting chickpeas this week was probably one of the most enjoyable gardening sessions I’ve every had. Plus, I didn’t even have to buy any fancy equipment or even put on some gardening gloves! My kind of gardening. When you sprout chickpeas it reduces the phytic acid content by about 40%. This means that you absorb a lot more of the minerals and protein that chickpeas have to offer. In fact, one serving of sprouted chickpeas contains 105mg of calcium, 115mg magnesium, 366mg of phosphorus, 875mg of potassium, and a whopping 557mcg of folic acid. As well as trace amounts of iron, sodium, vitamin C, thiamin, niacin, vitamin B-6 and vitamin K. Nutritious stuff! Rinse and soak 1 cup of dried chickpeas overnight. In the morning drain and rinse the chickpeas thoroughly. I just placed the drained chickpeas in a glass bowl and loosely laid a tea towel on top. Every 8 hours or so I rinsed and drained the chickpeas in clean water. I also occasionally gave them a gentle shake to allow some air to get to all the chickpeas. After just a few days they grew little tails. After several days they looked like the picture. When you’re satisfied with the length of tail, thoroughly rinse and drain the chickpeas and store in the fridge to stop them sprouting further. They’ll last about a week. I love sprinkling sprouts on my salad, but I’m also going to try making raw sprouted hummus and a quinoa and sprout salad this week for some variety. I’ll post the recipes here. 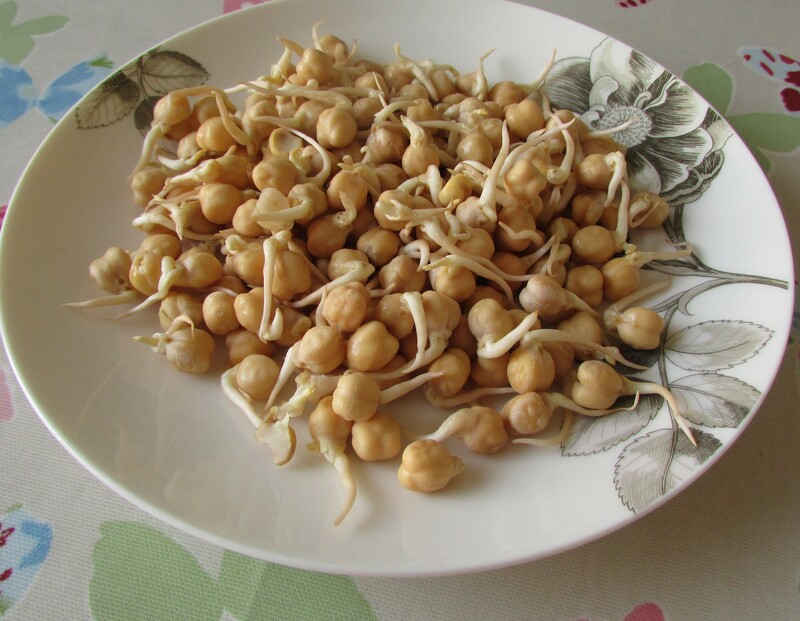 These sprouted chickpeas coast 14p to make – but you can buy them for a few pounds in health food shops if you prefer! 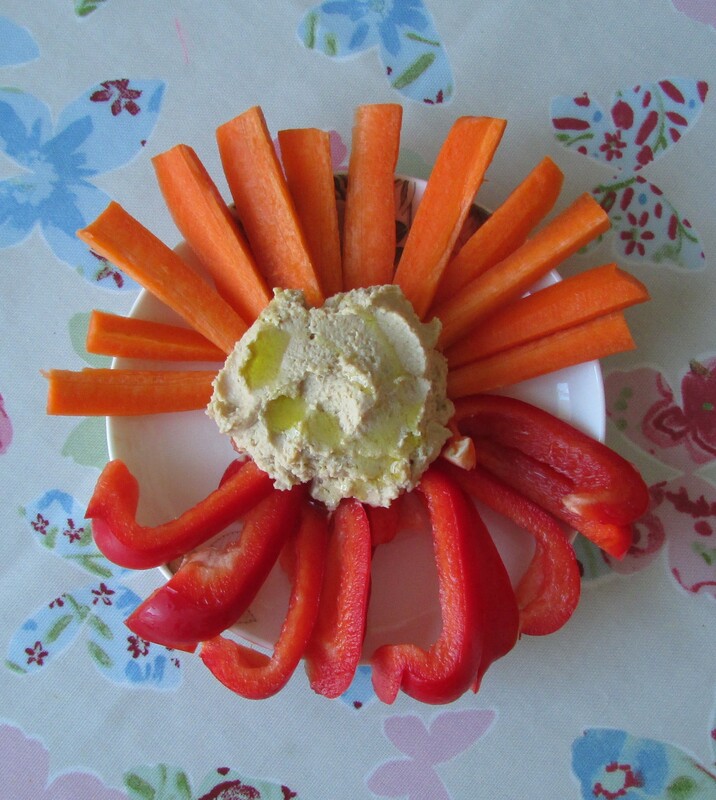 This entry was posted in Blog posts, Frugal family recipes on January 25, 2015 by carolinementzer.